Joy Sacopulos, 79, of Terre Haute passed away Wednesday, January 30, 2019 in Providence Healthcare. She was born July 20, 1939 in Terre Haute to Jack Foulkes and Jane Kivits Foulkes. Survivors include her husband of 58 years, Gus Sacopulos; sons, Peter Sacopulos (Melony) and Michael Sacopulos (Darla); grandchildren, Alexandria, Olivia, Nicholas, and Alexander; brothers, John Foulkes and Dr. James Foulkes; and sisters, Jeanne Rozel and Jill Lankford. She was preceded in death by her parents and sisters Jan Malone and Judy Baker. Joy was a tireless, innovative community leader who, for almost 50 years, dedicated herself to developing, improving and preserving the health and beauty of our environment, the quality of life of her fellow citizens and the appreciation of the history and heritage that is Terre Haute. 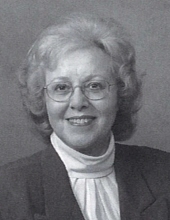 Joy is a founder and continuing volunteer of TREES, Inc., the Friends of Historic Allen Chapel, the Indiana Urban Forest Council, the Organ Donation Awareness Council of the Wabash Valley and the Terre Haute Crow Committee, Inc. She was a founder of Planned Parenthood of the Wabash Valley and Sacred Landmarks of Downtown Terre Haute. She was a member of St. Benedict Catholic Church. Her leadership and enthusiasm sparked positive new programs for Indiana Landmarks, the Indiana National Road Association, the Volunteer Action Center, the Vigo County Historical Society, Wabash Valley Goodwill Industries, the Florence Crittenden Home, United Way of the Wabash Valley and The League of Terre Haute. TREES, Inc., with Joy’s leadership and hard work of many volunteers, is responsible for planting thousands of sizeable trees and hundreds of thousands of daffodils throughout the community. Allen Chapel African Methodist Episcopal Church, Terre Haute’s only African-American building on the National Register of Historic Places,has undergone significant restoration because Joy was instrumental in raising more than a half-million dollars. Boy Scouts in the Wabash Valley can become Explorer Scouts thanks to Joy’s efforts to establish that program locally. And it was Joy who arranged to have the Crossroads of America state historical marker placed at the corner of Seventh Street and Wabash Avenue. This list only scratches the surface of the hundreds of ways Joy’s efforts, and the efforts of others whom she has influenced, have improved our community and our state. Joy received numerous honors for her community service including the United Way of the Wabash Valley’s 2012 Woman of Influence and the Servaas Award from Indiana Landmarks. That same year she received the Chapman S. Root award. She received The Level Above Award, the Trees Mighty Oak Award, Success by 6, and was a Sagamore of the Wabash Valley. She was awarded a Doctor of Humane Letters from Rose-Hulman Institute of Technology and the Boy Scouts of America (national) Silver Beaver Award. She was named IPALCO Environmentalist of the Year, the Indiana Urban Forest Council’s Outstanding Volunteer of the Year and Best Friend of Allen Chapel, among dozens of others. Mass of Christian Burial will be at 11:00 a.m. on Saturday, February 2, 2019 in St. Benedict Catholic Church with Father Martin Day officiating. Burial will be in Highland Lawn Cemetery. Visitation will be from 4:00 – 8:00 p.m. on Friday in Callahan & Hughes Funeral Home, 605 S. 25th Street. Memorial contributions may be made to Trees, Inc. or Indiana Landmarks. To send flowers or a remembrance gift to the family of Joy Sacopulos, please visit our Tribute Store. "Email Address" would like to share the life celebration of Joy Sacopulos. Click on the "link" to go to share a favorite memory or leave a condolence message for the family.